See a website for the book. A major figure in American blues and folk music, Big Bill Broonzy (1903–1958) left his Arkansas Delta home after World War I, headed north, and became the leading Chicago bluesman of the 1930s. His success came as he fused traditional rural blues with the electrified sound that was beginning to emerge in Chicago. This, however, was just one step in his remarkable journey: Big Bill was constantly reinventing himself, both in reality and in his retellings of it. Bob Riesman’s groundbreaking biography tells the compelling life story of a lost figure from the annals of music history. I Feel So Good traces Big Bill’s career from his rise as a nationally prominent blues star, including his historic 1938 appearance at Carnegie Hall, to his influential role in the post-World War II folk revival, when he sang about racial injustice alongside Pete Seeger and Studs Terkel. Riesman’s account brings the reader into the jazz clubs and concert halls of Europe, as Big Bill’s overseas tours in the 1950s ignited the British blues-rock explosion of the 1960s. Interviews with Eric Clapton, Pete Townshend, and Ray Davies reveal Broonzy’s profound impact on the British rockers who would follow him and change the course of popular music. Along the way, Riesman details Big Bill’s complicated and poignant personal saga: he was married three times and became a father at the very end of his life to a child half a world away. He also brings to light Big Bill’s final years, when he first lost his voice, then his life, to cancer, just as his international reputation was reaching its peak. 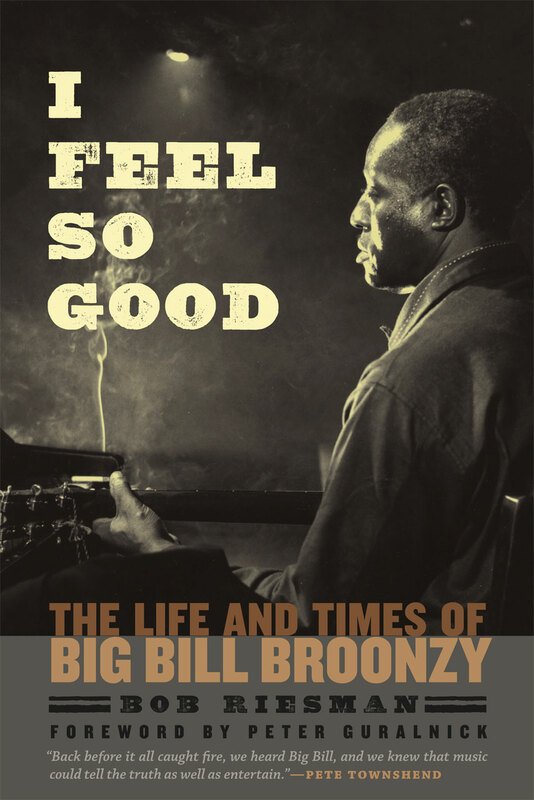 Featuring many rarely seen photos, I Feel So Good will be the definitive account of Big Bill Broonzy’s life and music. 3 When Will I Get to Be Called a Man? 4 Let’s Go Away from Here! "Mr. Riesman’s detailed biography should remind some of today’s musical millionaires and their fans of the debt they owe to a player whose first instrument was a corn-stalk fiddle." "He was one of the most celebrated blues artists of his era, a visionary Chicago singer-songwriter who mentored Muddy Waters, introduced the music to Europe and inspired no less than Eric Clapton, Ray Davies and Pete Townshend (as they’ve all acknowledged). But Big Bill Broonzy has been virtually forgotten by the popular culture he helped shape. . . . Which is why an important new book, I Feel So Good: The Life and Times of Big Bill Broonzy, comes not a moment too soon. In its pages, author Bob Riesman pieces together fragments of a hitherto under-documented life, giving Broonzy’s achievements the honor they deserve." "Big Bill Broonzy was a towering figure in music during his lifetime, a blues singer, guitarist, and songwriter who mentored and influenced everyone from Muddy Waters to Eric Clapton. Author Bob Riesman was shocked, then, to realize that a definitive biography hadn’t been written about Broonzy. Riesman finally remedies that with his thoughtful new book, “I Feel So Good: The Life and Times of Big Bill Broonzy,’’ a labor of love that took him 10 years to complete." "Wonderful. . . . With skill and sensitivity, Riesman has traced [Big Bill Broonzy’s] scattered families and friends, and the letters, photographs and tapes they preserved, to fashion an intricately stitched patchwork of a life, and one of the great blues biographies."